Creating a budget for a project has never been so easy! This workbook organizes all your financial information for a project and highlights helpful totals. 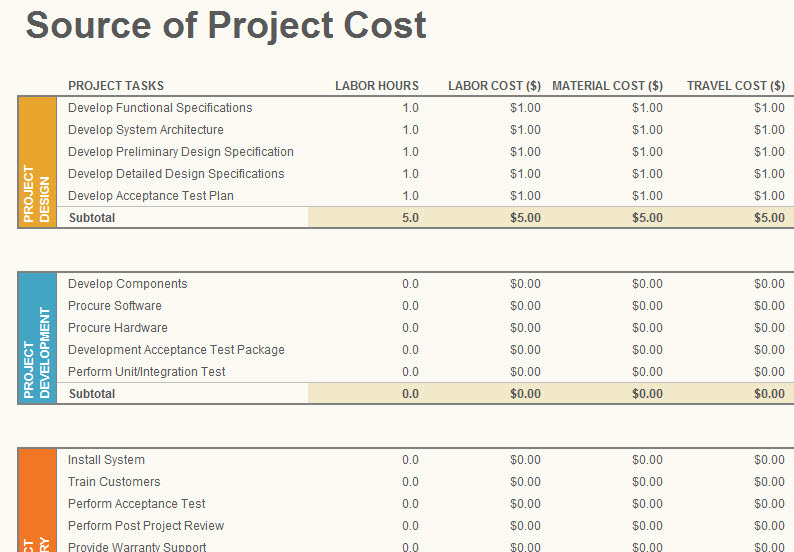 Quickly view project costs for every aspect and even the costs that occur over a period of time. Make your life easier today with the Project Budget Workbook. After downloading the Budget Workbook and clicking on the file, you will be able to start organizing your project. With the initial page open, you can see how the template organizes the various types of expenses on one simple page. The workbook separates the sections as: design, development, delivery, and management, so everything is logged by the end of the day. The third tab conveniently displays the totals for every element of your project, and gives you a simple graph that analyzes the projected cost compared with the actual cost. The “Data Worksheet” tab allows you to easily transition from one month to the next, for longer projects, and see an overview of all your cost data, giving you the opportunity to identify trends and budget tasks accordingly. When you have all the information entered, simply click the “File” tab in the top left corner, and select the “Print” option, to have the project budget template sent to your printer, or choose the “Save As” option to store the budget on your computer and keep everything digital. Professional looking design is easy-to-read and customize.